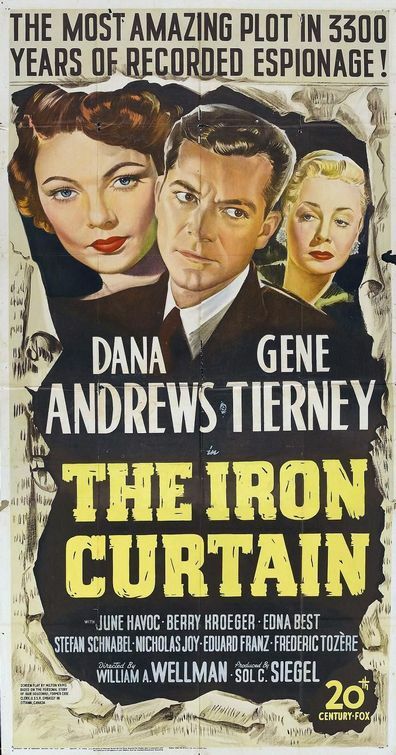 The Iron Curtain sounds like an exciting tale that proves that juicy stuff actually happens in Ottawa politics. For example, rumour has it that the film shows street cars whizzing by as Andrews and leading lady Gene Tierney stroll about the Bytowne and sightsee at the locks of the Rideau Canal, so you can expect a lively-post screening debate about light rail in the capital. (At the rate it's going, too, this is probably your only chance to see it!) Additionally, this ripped from the headlines thriller, which based on an article by Gouzenko himself, offers a glimpse into how Hollywood was channelling fears of Communism in post-war America. In May 1948, New York Times reported that the Russian composers whose works were used in the film had written a letter to the Soviet newspaper Izvestia in which they described the picture as "loathsome" and accused Twentieth Century-Fox of stealing their music. Time reported that they had "begged a New York court to cut their music from the sound track; it might make them look like traitors at home, their lawyers argued." Alfred Newman, head of the studio's music department, stated to the New York Times that although the composers' works were in the public domain in the United States, his studio had an agreement with the Leeds Music Co. and its subsidiary AM RUSS, giving the studio the right to draw from the Leeds editions of the four composers at will. A flat sum and a further price per composition had been agreed upon in advance, and between $10,000 and $15,000 would be paid to Leeds upon release of the picture. On June 8, 1948, Los Angeles Times reported that New York State Supreme Court Justice Edward Koch had ruled that the music in question was in public domain and enjoyed no copyright whatsoever. I'm sure Kim Novak could lend some choice words about music sampling, but add a bit of scandal to the novelty of seeing Ottawa on film, and The Iron Curtain seems like a pretty good way to spend ten bucks. (Only seven for members!) The film plays at 4:05 today and at 9:05 on Monday. 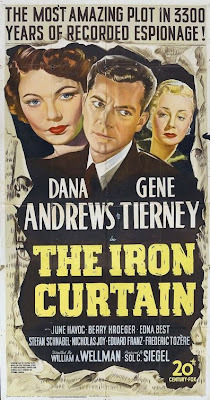 Please see http://www.bytowne.ca/movie/the-iron-curtain for more details. Hope to see you there! Also, if the Ottawa connection inspires an appetite for home cooking, make The Iron Curtain a double (or triple) bill with Take This Waltz and/or Cosmopolis!